In his Histories, the Greek writer Herodotus records a curious custom of the Persian government. When faced with a crucial decision, the leaders would discuss the matter twice: once when sober, and again when drunk (or vice versa). This way they could be sure to consider multiple options and find the best solution to their problem. Whether or not that story is true, the idea behind it brims with possibility. Over the past decade of their careers, the Coen brothers seem to have been attempting the cinematic equivalent of this decision making process. It has become commonplace to note that, in the years since 2007’s No Country For Old Men, the brothers have reliably alternated between serious fare and lighter comedies, often explained as a chance for the duo to catch their breath between dramas. But what if this new rhythm suggests a more fruitful interpretation? It makes sense to view the six films they have made in this span not as a series of movies connected only by the stylistic quirks of their directors, but as a series of diptychs, each dealing with a discrete subject viewed from multiple vantage points. Each comedy acts as a complement to the drama that has preceded it, shedding new light on the central preoccupations of its predecessor. 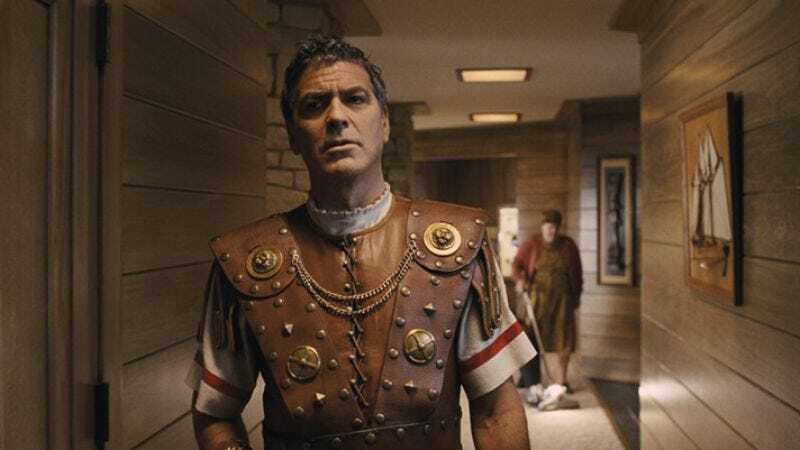 No Country shares an important DNA strand with Burn After Reading; A Serious Man has more than a glancing relationship to True Grit; and Inside Llewyn Davis finds its counterpart in the newest Coen film, Hail, Caesar! On the surface this schema might seem ridiculous, given the extreme disparities in structure, plot, and tone between any of the listed pairs. The Coen brothers, though, have always been first and foremost filmmakers of ideas, building the worlds of their films around core concepts that radiate out from the center. This is why detractors have often described their films as cold, clinical, or unfair to characters, because everything else takes a back seat to the tortuous working out of a main idea. These three pairs of films, appropriately, each tackle a big problem of the sort the Coens love. No Country and Burn both attempt to answer the question of what motivates people to commit evil. A Serious Man and True Grit have somewhat similar concerns, but both films shift the question slightly to ponder the existence of God, and what sort of justice an existing deity might enact. Finally, Llewyn Davis and Hail, Caesar! turn to a less violent, though equally serious, problem: What value does art have in the world, and what place might the artist occupy in it? In each case, the brothers make two crucial changes to their approach to the question between the film pairs. The most obvious is, of course, the shift from drama to comedy, a change that alters not only tone but the philosophical possibilities of each film. Less noticeably, they also move from telling stories focused on individuals to films where communities take center stage, a move that not only enhances the comedy but radically changes the ground for exploring the question under consideration. No Country For Old Men begins with a voiceover monologue from Sheriff Ed Tom Bell (Tommy Lee Jones), who ponders the legacy of lawmen in West Texas, but also recoils from what he sees as a recent change in the reasons for criminality. Bell relates the story of a teenager sentenced to death on his own testimony, who tells him just before death that he had always planned to kill someone, and would do it again without hesitation. “I don’t know what to make of that,” says Bell, in a line that becomes key for interpreting the moral universe of the film. Anton Chigurh (Javier Bardem), the relentless killer who stalks through the film like an angel of death, embodies this “new” (though doubtless very old, in reality) type of criminal, one who murders without regret and seemingly without cause. Though characters insist he abides by a code, that code seems at best inscrutable, at worst inhuman. He kills to excess, murdering not only those who stand in his way, but anyone in the near vicinity. Encounters like the gas station scene, where the attendant must unknowingly wager for his life with a coin toss, underline the fundamentally irrational nature of Chigurh’s evil. At one point bounty hunter Carson Wells (Woody Harrelson) gets asked how dangerous Chigurh is. He replies: “Compared to what? The bubonic plague?” Chigurh acts as a force of nature in the film, not merely with regard to his overwhelming power, but precisely because he seems to have transcended human boundaries and achieved a state of natural indifference. The Coen brothers narrow in on this elemental evil by keeping a strong focus on the three main characters—Bell, Chigurh, and Llewelyn Moss (Josh Brolin), who gets caught out of his depth in dealing with the pitiless Chigurh. The characters typically work in fundamental isolation from one another, except in their rare but violent confrontations. This is a hard world, and people must go it alone, with no expectation of mercy; indeed, Moss’ initial act of mercy, returning to a crime site to give a dying man water, allows Chigurh to set out on his trail in the first place. Life has no explanation, and neither does human evil, a situation so desperate that it compels Bell to retire in despair at the end of the film. Burn After Reading may have an equally cynical take on why humans do bad things, but it shifts away from the elegiac mourning of No Country and into the mode of satire. Following Aristotle, who famously argues that comedies should focus on characters of lower status and moral fiber than the audience, the Coens fill Burn with an array of the lowest, most petty people imaginable. Though set around the edges of the intelligence community in D.C., the film has little of the tense cat-and-mouse game you would expect from a world of spies. Instead, events occur because of sheer chance or incompetence, and one thing just sort of follows another. Each character comes saddled with a defining flaw, from Harry’s (George Clooney) lust to Katie’s (Tilda Swinton) ruthlessness. Here, though, the characters are mired not in Chigurh’s unfathomable cruelty, but in the mud of human existence, their grandiose plans constantly backfiring because of their own limitations. The film itself turns on possession of a piece of intelligence that turns out to be a worthless, poorly written memoir, and likewise every gesture toward a broader conspiracy dissolves into a more grounded, humorous explanation. The car that follows Harry around does not carry agents sent to kill him, only an investigator recording his marital infidelities. By the end of the film, the CIA managers monitoring the plot from above conclude that nothing significant has happened, and shut down the investigation. Yet to the characters, their actions feel significant, and in fact do come weighted with consequence. Linda (Frances McDormand), the gym employee who envies the hard bodies around her, pushes those in her orbit to join in her foolish quest for blackmail money. Blinded to everything but her own vanity, she unwittingly pulls disaster down on those around her. Unlike No Country, with its isolated figures, Burn After Reading takes full stock of the chaos wrought by human misdeeds, a fact underscored visually by the film’s opening and closing shots of satellite images of the earth. It may be a comedy, but the characters pay a high price for getting caught up in the whirlwind. If these two films provide very different answers to the problem of evil—evil as irrational and overwhelming versus evil as petty and all too familiar—then the next pair spins out a similar tension on a grander scale. Like many Coen films, neither A Serious Man nor True Grit fit easily into strict categories. But in the end, A Serious Man makes the most sense as a very funny tragedy, while True Grit works best as a melancholic comic Western. This distinction holds especially true when considering the answer each film provides to its central problem: the existence and justice of God. The world of A Serious Man is one of tragic isolation. Protagonist Larry Gopnik (Michael Stuhlbarg) struggles to discern the existence of God in a universe where chance reigns supreme. He cannot reconcile his Jewish faith with the terrible things that befall him, and this results in an existential despair that layers itself on top of his physical and psychological torments. By contrast, Mattie Ross (Hailee Steinfeld), the heroine of True Grit, approaches her own terrible situation with firm confidence that God and justice remain on her side. Despite undergoing a battery of trials in the wilderness, she ignores the temptation to despair, instead trusting in the right ordering of the universe. Larry’s obsession with explaining the unexplainable gradually alienates him from the tight knit community in which he lives. He experiences physical exile to The Jolly Roger Inn after the breakup of his marriage, but he also undergoes a crippling emotional isolation. He cannot help his son prepare for his bar mitzvah, or even begin to understand his moody daughter; worst of all, he cannot reach beyond himself to aid the most vulnerable character in the film, his brilliant but troubled brother. The Coen brothers deploy a series of dream sequences, undercutting the hoariness of the trope by homing in on Larry’s inability to escape dread, even while asleep. Mattie, meanwhile, starts the film cut off from her support network, as she leaves Arkansas for the Oklahoma territory to find the man who killed her father. Despite being young and underprepared, she plows through adversities thanks to her unwavering belief that things will work out. Though religion comes muted in True Grit, the film clearly aligns Mattie’s thirst for justice with her belief in God, something underscored by Mattie’s quoting of scripture but also by Carter Burwell’s music, which borrows heavily from the traditional American hymn “Leaning On The Everlasting Arms.” With a sort of firm Calvinist take on divine justice, Mattie pushes ever forward, but in the process she also forms a new community around her, providing purpose and redemption for the two lawmen who accompany her on her quest. Unlike Larry, whose chaotic world causes him to get caught up in his own head, Mattie’s ordered universe allows her to live for others. The titular hero of Inside Llewyn Davis lives very much in the mold of Larry Gopnik. Llewyn (Oscar Isaac) exists in a state of isolation, though here the terrible things that happen to him and those around him come from internal, not external, sources. Questions of evil and divine justice get shunted aside, mostly, in Llewyn’s story, in favor of an examination of the consolations of art. A failing folk singer, Llewyn struggles to recover from the death of his music partner, inflicting his own misery on those who try to help him. Caught in an endless cycle (something reflected in the structure of the film), he exists in atomic isolation, finding release only in the music which has failed him in the real world. Eddie Mannix (Brolin), protagonist of Hail, Caesar!, faces similar questions about the value of his work. Up before dawn, away from his family all day, Mannix does the dirty work of making sure Capitol Pictures, a ’50s era Hollywood studio, keeps running smoothly despite the many outlandish escapades of its stars. Mannix feels run down by his work, and considers a plush job offer from Lockheed, whose representative cajoles him to join the real world of the military-industrial complex. The film doesn’t exactly make his job seem worth the effort: The films Capitol produces run the gamut of disposable dreck, from empty melodramas to insipid musicals. Both characters face the agony of justifying their own work, but with wildly different results. Llewyn, trapped in a tragedy, can find no escape from music. He tries, near the end of the film, to quit music, but circumstances push him back in, as hopeless as ever. Yet if music chains him to his circumstances, it also provides relief. Like Sisyphus, Llewyn takes a certain pride and comfort in his own boulder, no matter how many times it crushes him. Music also presents Llewyn his only chance to connect in a meaningful way with others. Though music has driven a wedge between him and others, like his faithful friends the Gorfeins, by the end Llewyn has at least once reached out to another person through his songs, when he plays for his dying father. Eddie of course does not actually make the movies that Capitol releases; he merely does everything else that makes those films possible. Thus Hail, Caesar! opens up the world of artistic creation, suggesting that it is not an individual venture, but the work of many hands. The comedy of the absurd situations in the film elicits laughter, but it also binds Eddie to his job with affection: He needs the crazy stars he herds like cats, because they give him a window beyond himself. Despite the apparent superfluity of the films Capitol makes, the film also suggests that glimpses of the sublime can still emerge, as in the quiet moment when the Catholic Eddie stands at the foot of the cross, which is really just a prop from the film within a film, an overblown Biblical epic. Art, the film suggests, breaks through when we least expect it. If in Inside Llewyn Davis art presents the one comfort in a cold, harsh world, then in Hail, Caesar! it descends as a gift from above to bless the silly lives of humans. What benefit exists from viewing this particular phase of the Coen filmography in this way, through paired opposites? Who knows, of course, whether the brothers planned alternating films on the same theme, and they have certainly worked through these same central questions in other films. Perhaps the best explanation is still the simplest: that it’s emotionally exhausting to make serious films, so they sprinkle in comedies to provide themselves relief. But something dialectic (to use a favorite term of the absurd Marxist screenwriters in Hail, Caesar!) occurs when you read the films in each pair against each other. Many have treated the nihilism of No Country For Old Men as a high point of profundity for the Coen brothers, but the film, taken by itself, feels lacking in its vision of the world. It is still profound, but it carries the blinkered profundity of a work tenaciously committed to one viewpoint; its grim world provides a lot to chew on, but no one can live there all the time. Viewing Burn After Reading as the cheeky retort to No Country’s solemnity, far from diminishing the earlier film, puts its virtues in clearer perspective. Likewise, Burn After Reading’s glibness feels coarse without the tragic counterweight provided by No Country. In the same way, the chaotic tragedy of A Serious Man finds its answer in the ordered comedy of True Grit, and Hail, Caesar! responds to the anxious aestheticism of Inside Llewyn Davis with a warmer vision of what art can do. Maybe, then, the Coens have intuited what Xerxes and his court understood, that humans need both perspectives to make sense of life. Tragedy gives us the clarity to view the genuine harshness of life, to see the flaws that pull humankind relentlessly down. Yet the madness, the drunken excess of comedy, allows us to agree with Verdi’s Falstaff that “All the world’s a joke—all men are born fools.” To weep and to laugh are the most basic human reactions to the world around us, and the line distinguishing them frequently blurs into nothingness. By giving audiences these diptychs that enrich each other, the Coen brothers have offered a double vision of the world that one look alone cannot match.